Snack crackers are so versatile. But most of the ones on the market are off limits to the gluten-free. But thanks to the abundance of gluten-free products hitting the shelves these days, it seems every gluten-free company out there has at least one variety of snack cracker. Some…have more. I’ve enjoyed the likes of Crunchmaster, Mary’s Gone Crackers, Blue Diamond, Schär, etc. But most recently, I have been exploring the different flavors of crackers that Glutino has to offer. Now, Glutino and I have a rather good relationship as far as the taste of their food. So far, I have had nothing to complain about. Texture, taste, density, and flavor have all been right on par. I appreciate that. Given the fact that I haven’t been gluten-free my entire life, I know what the ‘real’ thing tastes like and sometimes have a hard time separating that from what I now have to eat. In other words…I find common gluten-free foods not up to the standard I once knew. And then…sometimes I find something better. Glutino has been good to me and for me. And that trend continues with my tasting of Glutino Multigrain Crackers. These gluten-free crackers actually surprised me with their flavor. I have since looked up a few reviews, most of which bitched about the overpowering fennel flavor (fennel tastes like licorice). I don’t like licorice…but I don’t even get a taste of it in these crackers. In fact, I currently no longer even see fennel listed on the ingredients list. The poppyseeds are still part of it…and you can certainly see them in the surface of the cracker. But fennel…not anymore, I don’t think. Rosemary extract though…that’s there! The bizarre thing about these crackers is…they taste like Triscuits…just without the graininess and shredded bits. It’s like…if a Ritz and a Triscuit were to get married…this would be the offspring. Honestly. It’s the perfect blend of that butter Ritz texture with the flavor of a Triscuit. It’s…fantastic, honestly. And this would be amazing with a schmear of cream cheese, cheese, salsa, hummus…whatever…on top. But on their own, they too are astounding in their flavor. I loved this cracker…bite-for-bite. So…how did I end up with these in the first place? Long story short…one of my local grocery stores was running a mega closeout on the gluten-free section. Fearing that it was going to be gone for good, I stockpiled items I wanted to try, but could never quite justify to work into the budget. That’s how these ended up in my pantry…and it just so happened it was their turn to shine during my afternoon snack time this week. And shine they did. 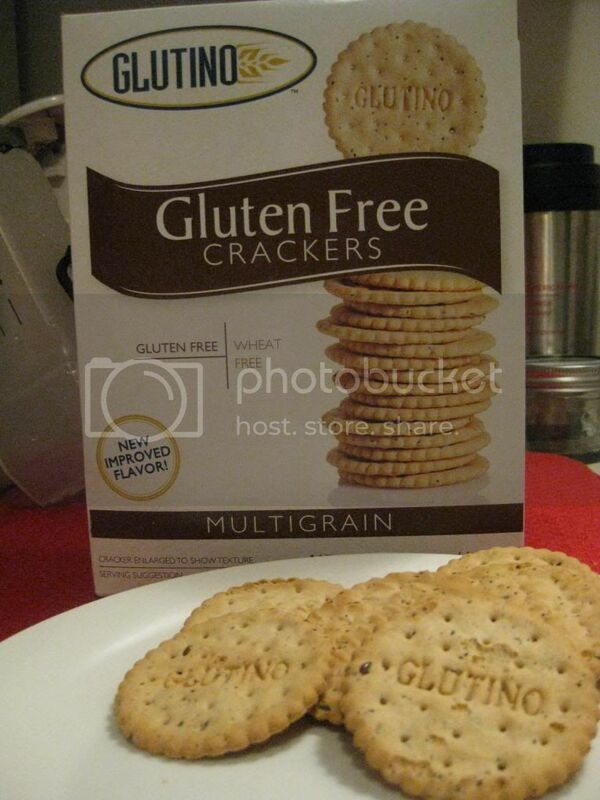 I highly recommend these as a cracker for any get-together where gluten-free options are needed. Or…just in general. My roommate, who tries everything I eat, also enjoyed these. She was the one who made the Triscuit connection (she would know! )…and I couldn’t agree more. Fantastic seasoning, not laden with salt, great flavor, and just amazing from one bite to the next. Nutritionally speaking, because I do always go there, these aren’t bad for a snack cracker. A serving size is 30 grams (and you know I weigh out my servings! ), or about 8 crackers. This serving would set you back only 14o calories and 4.5 grams of fat. That’s not bad at all. These crackers only have 260 mg of sodium in the serving. While fiber and protein are both low, it’s a snack cracker…so use it with something like hummus that has some protein power to it. Nutritionally sound, and amazing in taste and texture. Glutino…you keep winning me over, heart, body, and gluten-free soul! This entry was posted in Crackers, Food, Gluten-Free, Products, Review, Snacks, Vegetarian by The Celiathlete. Bookmark the permalink.